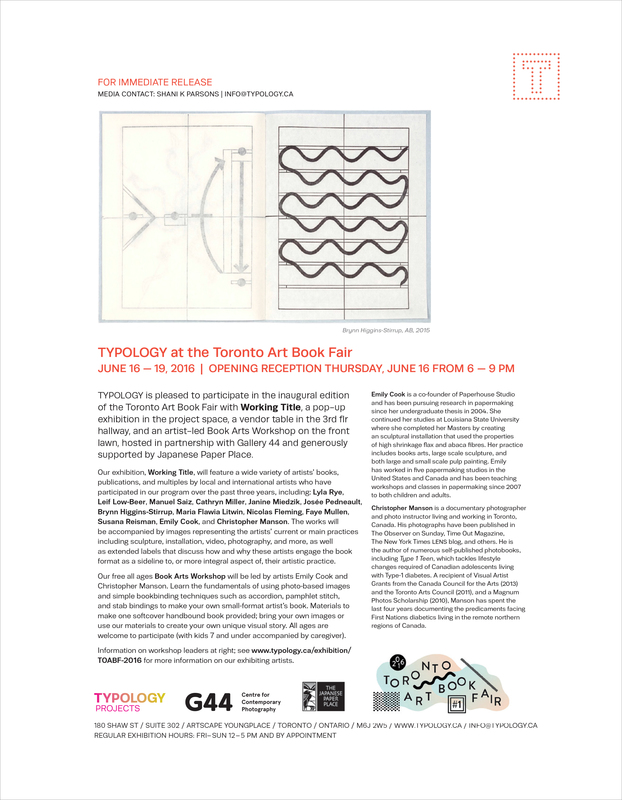 TYPOLOGY is pleased to participate in the inaugural edition of the Toronto Art Book Fair with a pop-up exhibition in the project space, a vendor table in the third floor hallway, and an artist-led book arts workshop on the front lawn, hosted in partnership with Gallery 44 and generously supported by Japanese Paper Place. Our exhibition, Working Title, will feature a wide variety of unique and editioned artists’ books, publications, and multiples by local and international artists who have participated in our program over the past three years, including: Lyla Rye, Leif Low-Beer, Manuel Saiz, Cathryn Miller, Tamara Gayer, Janine Miedzik, Josée Pedneault, Brynn Higgins-Stirrup, Maria Flawia Litwin, Nicolas Fleming, Faye Mullen, Susana Reisman, Emily Cook and Christopher Manson. The works will be accompanied by images representing the artists’ current or main practices including sculpture, installation, video, photography, and more, as well as extended labels that discuss how and why these artists engage the book format as a sideline to, or more integral aspect of, their artistic practice. 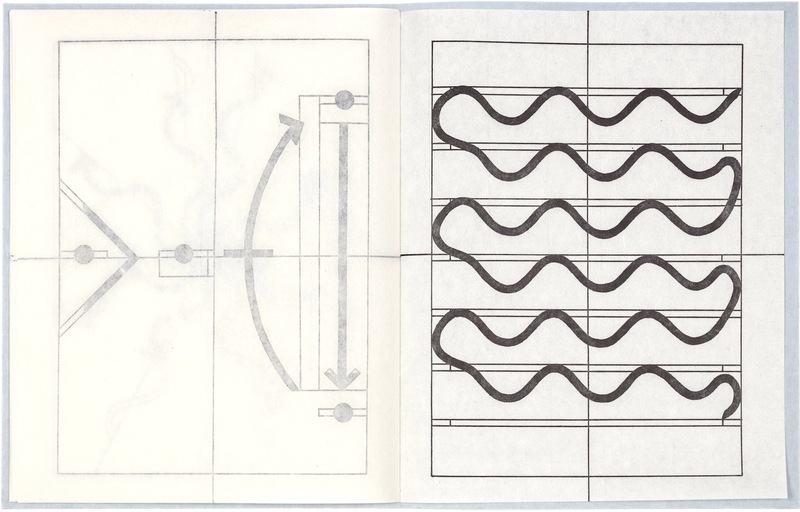 Our free all ages Book Arts Workshop will be led by artists Emily Cook (courtesy of TYPOLOGY Projects) and Christopher Manson (courtesy of Gallery 44). 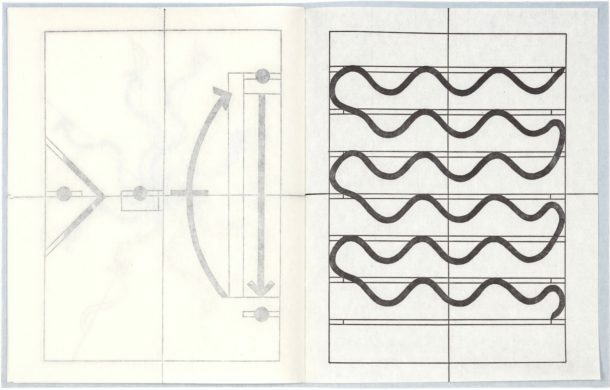 Learn the fundamentals of using photo-based images and simple bookbinding techniques such as accordion, pamphlet stitch, and stab bindings to make your own small-format artist’s book. Materials to make one softcover handbound book provided; bring your own images or use our materials to create your own unique visual story. All ages are welcome to participate (with kids 7 and under accompanied by caregiver). Join us in Suite 302 for the Working Title opening reception in conjunction with the TOABF launch party. Refreshments will be served and all are welcome! The Book Arts workshop will be held on the front lawn at Artscape Youngplace (in case of rain, we’ll move inside the building to a location TBA). Walk up and join right in!